Mechanic’s Lien Waiver Can Lien Waivers protect you against contractors/subcontractors? One of the safest ways to guard against you as the property owner receiving a lien on your property, include a subcontractor lien waiver in your initial contract. This is important if your intention is to hire someone to help you out in home improvement. 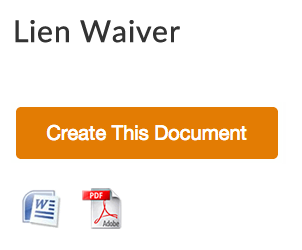 What is a subcontractor lien waiver? Now a lien is a form of claim that is placed on a property in order to make sure a debt is paid or to meet a certain obligation in exchange for materials that have either been supplied, or for the services rendered by a contractor or a subcontractor. A mechanic’s lien can be used by contractors and used to lay claim on a property whose owner owes money for services rendered. A contractor can use the lien on a property to enforce payment if he or she feels that the term of services have been duly satisfied. As a property owner, you must guard against your contractors or subcontractors owing their employees or not paying for the materials used on your property. If you do not do this, a lien can be placed on your property and you will be held responsible for the non-payment of the expenses incurred. The only way to avoid this is to ensure you have signed a subcontractor lien release form. You may be wondering or asking what to do to avoid liens during your projects. First of all you, as a home owner should ensure that you are working with contractors that are certified or licensed, bonded and insured; then make sure to include a subcontractor lien waiver clause in the project’s contract. With this lien waiver in place, both parties can sign off at the successful completion of the project and state that the contract requirements have been met; this also takes into account that the overall contractor has made all necessary payments to suppliers of materials, subcontractors and/or vendors. In case the general contractor is reluctant to sign off on this, you have the liberty to withhold payment until he or she has proved they have paid their suppliers and subcontractors. The importance of a subcontractor lien waiver cannot be overemphasized when it comes to using it for large projects that will involve working with contractors and subcontractors, equipment lessor, suppliers of materials as well as with any other group. Although the general principle about the enforcement of liens and subcontractor releases are the same everywhere, it is important to know how they are enforced in your particular area. This is because each state or borough has different criteria for the application of liens and their releases. Home owners should also take note that contractors nowadays are using liens during recessions, and can therefore, be held responsible for payment by material suppliers, electricians and other subcontractors.